The time might have come where you are looking at your front door and you are no longer satisfied. You are starting to realize that functionality, beauty, and resilience are all out the door. Your door might be letting insects and water in, or its become unsightly or has been succumbing to the burden of age. Whatever the reason, you need a new door, but you’re not sure where to start and you need door rescuers. 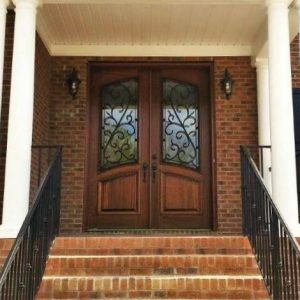 Southern Front Doors can be your local hero. 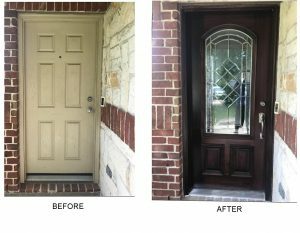 Not only do we offer an extensive online inventory, custom doors, and professional installation, but we offer the best customer service you can find in our industry. 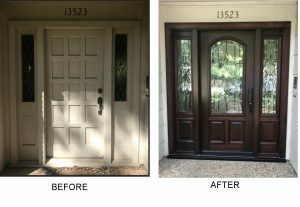 We want to show you some of our previous door projects and how we turned the front doors on a Houston resident’s house into an entrance fit for a castle. Let’s start with this example. In the first photo, you can see a flat, boring door which is a dirty beige and is very unappealing. On the right, we see a beautiful dark wooden door with an ornate handle and beautiful glass paneling laid in. Can you believe that the second door is standing where the first door used to? The difference between them is nothing short of shocking. If you have a door like the first, we can bet that you are wishing your door looked like the second. This before and after is more drastic than the first! The door on the left doesn’t even have any style, it is essentially a piece of wood screwed into the wall. The latter is beautifully polished and fashionable. It makes the front of the house look like a completely different place! In this example, the first door is not bad, but it is not special either. The design and color are both very blank and do not implore you to look further. However, the result has a special glow to it that draws you in! The oiled wood and polished glass make for a stunning look regardless of where it is. If you are looking for a door that will make a statement, we can help you. After all, the door will be the first part of your home that your guests interact with. If you are in need of making a change, we can provide you with it. You will never regret investing in the appearance and functionality of your home. 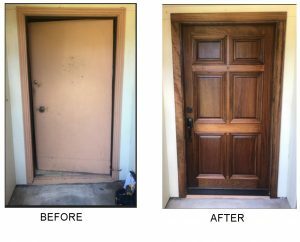 We can rescue your front door! If the above examples are any testament, there is nothing we can’t improve beyond recognition. You will be telling every guest about your door and who created it for you! When you are ready to contact us, you can call (281) 890-5860 or visit our contact page here. Don’t wait to make your door a masterpiece. Give us a call so that we can talk to you about your needs today!